' but later, they caught up to the prints that had no GO applied ' - how long was this period - weeks or months - for your test ? 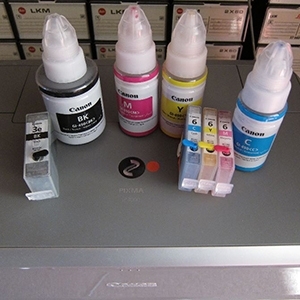 more effective to use pigment ink..
how long was this period - weeks or months - for your test ? I can’t recall the definite time line, but it was more than six months..
(measured with a scanner, deltas via the histogram vs. This makes a huge difference - the Epson ink is better after 15 weeks than the HP 727 ink after one week. I'm stopping this test here, the GO was supplied by the German octopus-office ink supplier, the GO of other suppliers may perform with different results, I already see a visible difference in gloss between this GO and the InkTec GO, the impact onto the fading performance may vary as well. @Ink stained Fingers, Your GO tests were very interesting, but what became clear to me is your GO worked well at the start as it did in my test, but as time went on it started to catch up to a point where it will make little difference..
websnail, PeterBJ and The Hat like this.